CSBD Presents You with The Amazingly Useful Beer Can Cooler Insulators Hold your favorite ice-cold beer or soft drink can without getting your hands wet and freezing cold. The Can Sleeves wrap around the Can drink of your choice and keep it cool for longer. As for your hands, they remain dry and warm. Durable Design That is Collapsible and Easy to Carry All of our can coolers are MADE IN THE USA of a durable 100% Thick Polyurethane Foam material. The Beer Can Cooler folds and becomes a thin, light weight item that can fit anywhere. Put it in your bag and use it wherever you go. All sleeves have been tested and are capable of fitting 12 oz. cans or 16 oz. water bottles with a snug fit! Choose Your Favorite Color and Personalize Your Can Coolers Don't settle on just any color, pick your favorite one, or as many as you would like! We have over 19 color variations and assortments to choose from to suit everyone's needs! We sell our can cooler sleeves in packs of 4 & 12 to provide our customers bulk options. Great for a variety of uses and events! DIY, do it yourself projects, beach, birthdays, parties, events, bachelor and bachelorette parties, fraternities, sororities, outdoors, camping, BBQ's, gatherings, fundraisers, businesses, organizations, monograms, or just for everyday use. There are ultimately endless opportunities and uses for this product! Don't Miss Out on This Amazing Product! 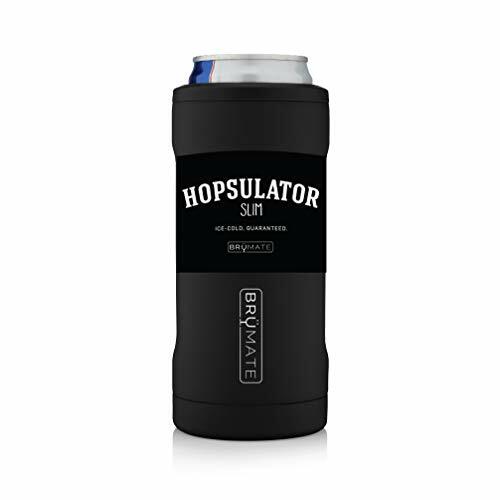 Add These Beer Can Coolers to Your Cart NOW! IDEAL FOR MANY OCCASIONS: A useful Can Cooler for all occasions including but not limited to BBQ's, camping, outdoors, festivals, fundraisers, parties, events, projects, and so much more. It keeps your drink cool and your hands dry! WIDE SELECTION OF COLORS AND QUANTITIES: Choose the color that you love for your 12, 25, or 50 pack of Beer Can Sleeves. We offer over 19 colors and assorted variations to choose from! MADE HAPPILY IN THE USA: Made of 100% Thick Polyurethane Foam, the Beer Can Coolers are extremely durable and stitched at the seams. All sleeves have been tested and are capable of fitting 12 oz. cans or 16 oz. water bottles with a snug fit! EASILY COLLAPSIBLE FOR STORAGE: Once you drink your favorite soda or beer, fold the Can Sleeve and put it in your bag. It is compact and lightweight so you can carry it with you when traveling. GET CREATIVE *DIY PROJECTS*: The Beer Can Coolers are blank, without any designs or annoying Logos. Be creative and personalize your Can Sleeve by adding your own touch. Markers, heat press, vinyl transfers, monograms, & more! Enjoy colder, crisper beers and sodas with flexible foam can and bottle Can Coolers design with Quality Perfection. Whether you love hosting backyard parties during the summer, enjoy a warm day at the beach, or just love kicking back for some lake fishing, keep your drink cold is essential when the heat starts to rise. That's why we created these premium Quality Perfect Coolies Can Sleeves designed to insulate your can or bottle and keep the contents fresh and delicious longer. These heavy-duty, flexible Coolies are made for long-lasting use and reliability, which is why they're both indoor and outdoor friendly. In fact, you can use these blank Can Coolers for wedding, birthday or holiday parties, bridal showers or family reunions, backyard barbecues or mixers, as novelty or block party gifts, and so much more! Polyurethane Foam Coolies (Bulk) Insulated, Form-Fitting Design Fit Cans and Bottles Choose from 4, 6, 12, 25 , 50 or 60 Packs Multiple Colors and Collections Available Satisfaction Guaranteed Get a pack of our blank can cooler can coolers today by clicking 'Add to Cart' above and make sure your next party, event, or gathering is truly unforgettable. 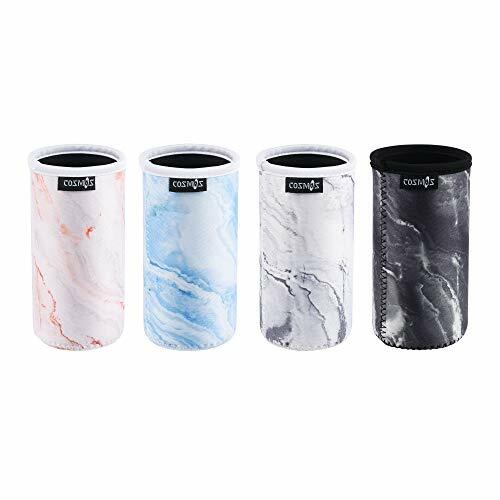 Insulated Can Coolers - These party drink can cooler sleeves help maintain crisp, cool drink temperatures while you're outdoors in the heat for tastier beer and soda. 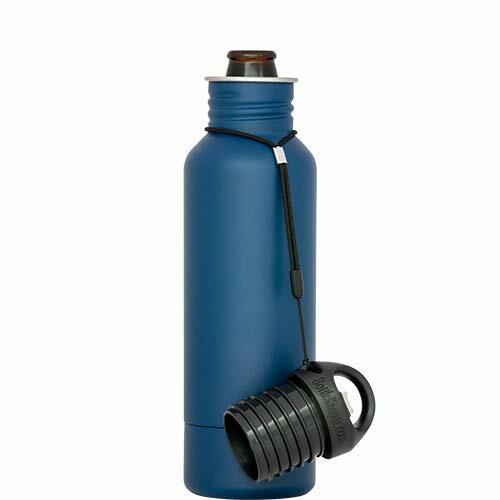 Multipurpose, Convenient Use - Also made for longneck glass and plastic water bottles, these collapsible Can Coolers for cans are great for kid and adult beverages.Scuba knit polyester fabric on polyurethane foam insulator. 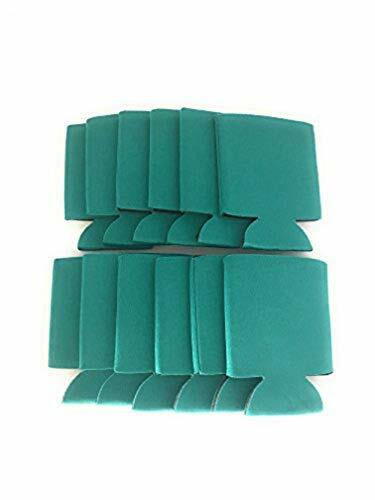 Bulk Blank Coolie Sets - Choose from packs of 4, 6, 12,13,24, 25, 50,60 or 100 can cooler can sleeves for personal use or for DIY marketing, advertising, drop shipping sales, or epic parties! Bright, Vibrant Color Sections - These beer cooler come in a wide range of bold colors, including black, pink, red, blue, green, orange, camo, White, purple and yellow. FUN and UNIQUE marketing tools, these are a great way to get your company or event noticed without having to overspend on the budget set aside for your special day. IDEAL FOR MANY OCCASIONS : Extremely popular and perfect for Weddings, Backyard BBQs, Birthday Parties, Camping, Bon Fires, Family Reunions & Picnics, Bachelor and Bachelorette Parties, Bridal Showers, Block Parties, Dance Parties and Mixers, Graduation Parties, Retirement Parties, Gag Gifts, Novelty Gifts, Mother's Day, Father's Day, Housewarming Gift, Hostess Gift and Family Gatherings. Colder Beer is Better. It's Science. BottleKeeper 2.0 is insulated to keep your beer colder, longer, and protected from gravity. Bottle opener included, cold beer is not. Bummer, we know. Comes with 100% Satisfaction Guarantee and Lifetime Warranty. Like, whoa. The base is padded for impact. 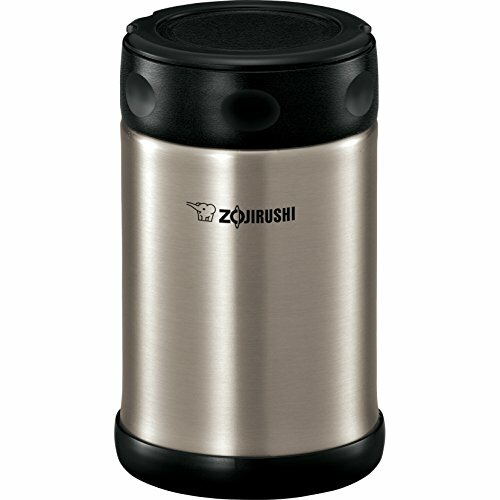 Enjoy a tasty lunch wherever your day takes you with a Zojirushi 25-oz. Stainless Steel Food Jar. Designed with vacuum insulation, it keeps foods and beverages hot or cold for hours. The tightly fitted lid with gasket seals also maximizes heat retention and prevents leaks during transit. A wide opening makes this jar easy to fill, eat from and clean. Couples gifts...Engagement Gifts...Wedding Gifts...Anniversary Gifts...If you are having trouble finding the best wedding gift or couples gifts for the bride and groom as you are getting ready to attend their wedding, look no further! Or, if you are looking for the perfect wedding anniversary gift for the couple of many years, this is it! Need some bridal shower gifts? Need some engagement gifts for him and her? They work for those too! A great his and hers gift. These Mr. and Mrs. can cooler beverage insulators will be sure to get a smile out of the Mr. and out of the Mrs., regardless of the occasion. Plus, they will have some awesome beverage holders to keep their drinks cold! One of the best wedding gifts you can get at a wonderful price. Beauty truly is in the eye of the beer-holder... that is why this funny wedding gift is prefect not only as a wedding gift but also as a wedding anniversary gift, a bachelorette party gift, a bachelor party gift, or any occasion that celebrates the bride and groom, husband and wife, or couple of any kind. Aside from the humorous gesture, this funny wedding gifts premium neoprene beverage cooler will serve a practical purpose in the home of the newlyweds. A standard 12-ounce can will fit nicely inside, and beverages will stay cool longer. As an added bonus, your hand will not get cold while you drink either! Keep these can coolers accessible and nearby to the refrigerator and use them for all of your can cooling needs! And once again, don't forget...beauty is in the eye of the beer-holder! 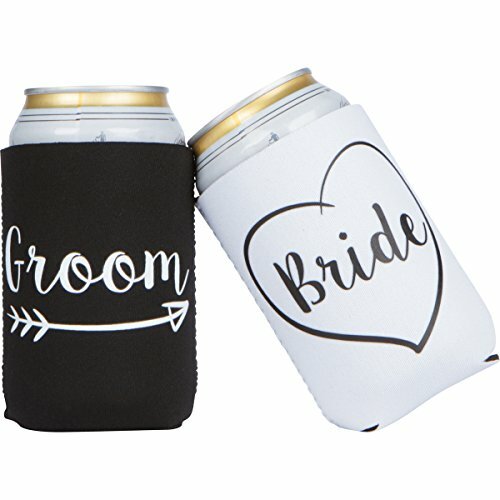 ENGAGEMENT GIFTS - Set of 2 foam can coolers sure to make the bride and groom smile! ANNIVERSARY GIFTS - Groom beverage insulator fits 12-ounce cans and reads Mr, wedding gifts bride beverage insulator fits 12-ounce cans and reads Mrs. Keeps drinks cold! Can coolies are great 40th birthday party ideas. Your 40th birthday party supplies aren't complete until you've got 40th birthday party favors. 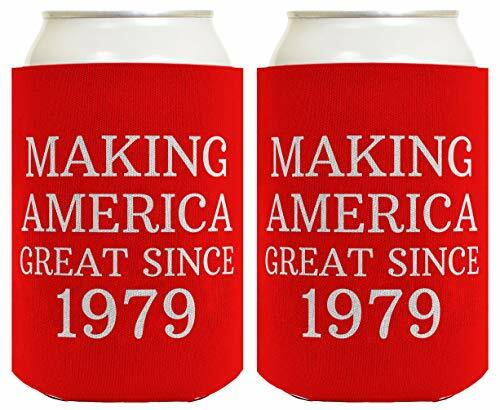 If they've been making America great again, these 40th birthday gag gifts make perfect 40th birthday gifts for men or 40th birthday gifts for women. Republican gifts like these make great political gifts for a member of the Republican party. This vintage style can cooler is perfect for keeping your drink cool while the party heats up. Coolies make a great gift or party favor. They are a memento with purpose and lasting value. Premium 1/8 inch thick high density open cell polyurethane foam keeps your drink perfectly insulated. Coolies fold flat for easy storage and are machine washable. Can coolies are great 40th birthday party ideas. Your 40th birthday party supplies aren't complete until you've got 40th birthday party favors. If they've been making America great again, these 40th birthday gag gifts make perfect 40th birthday gifts for men or 40th birthday gifts for women. Republican gifts like these make great political gifts for a member of the Republican party. 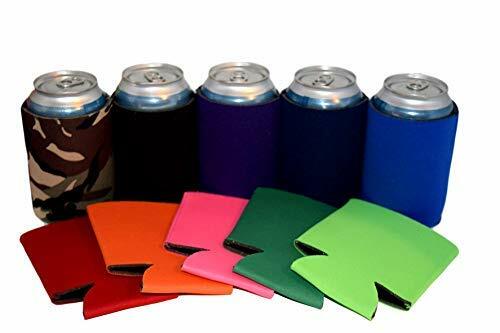 Pack of 4 Soft Neoprene Material Slim Can Sleeves Insulators Slim Can Covers for 12 Fluid Ounce Energy Drink & Beer Cans. IMPORTANT: This item fits for general 12 Fluid Ounce Slim Can only. Please check before purchase. - Suitable for most slim 12 oz cans or bottles to keeps warm and cold and your hands dry. - Each size: each piece about 5" H x 2-3/8" Dia. - Color: Black Marble Pattern, Orange Marble Pattern, White Marble Pattern, Light Blue Marble Pattern. Durable and flexible Soft Neoprene. Suitable for most 12 fl oz slim cans or bottles to keeps warm and cold and your hands dry. IMPORTANT: This item fits for general 12 Ounce Slim Can only. Please check before purchase. Stitched fabric seam on the top of sleeve makes it sturdy and durable. Material: Durable and flexible Soft Neoprene; Each size: each piece about 5 H x 2-3/8 Dia. Color: Black Marble Pattern, Orange Marble Pattern, White Marble Pattern, Light Blue Marble Pattern. Provides premium appearance and value to the can sleeves. Each package including 4 pcs can sleeves, each color with one piece. Why buy our retirement beverage coolers? Every time you order one of our retirement gifts for men 6-Pack of can coolers, a horn blasts and all our employees stop what they're doing to give high-fives because retired guys and gals rule! Wouldn't you love to hear that you are the reason for our happy customer service department?! Avoid frostbites from your frosty beer! Keep your beer chilled and just the way you like it! Handy for retirement parties, BBQ's, camping, man cave accessory, outdoors, festivals, beach parties, 4th of July d cor, special events, fishing, Memorial Day, tailgating, bachelor parties, picnics, birthdays and more! 100% Money Back Guaranteed if you do not like it return it. If you would like to order more than one 6-pack, email us on our seller account for an exclusive coupon. GIFTS FOR RETIREMENT | 6-Pack of Premium Foam Beer Can Sleeves are the best retirement gift ideas. The man or woman has worked decades and it's now the legend has retired and it's time to enjoy their retirement, pension or no pension with beer gifts for men! Way better than a retirement mug or retired shirts for men, who needs coffee mugs when you can tell the world you are retired in style! Whether for a birthday gift or a retired gift, you can't go wrong with these retired gifts for men. 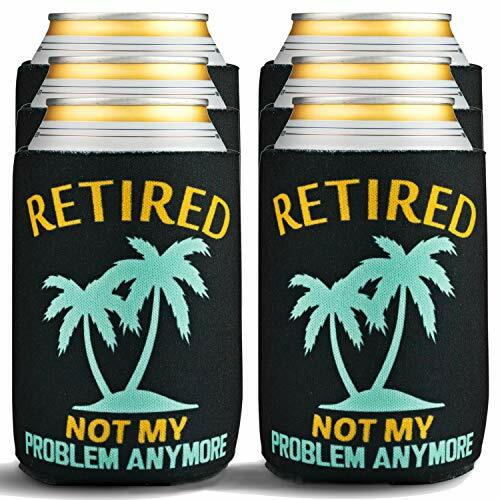 RETIRED NOT MY PROBLEM ANYMORE | Sit on your porch, in a boat or on your couch and say to the world Retired not my problem anymore holding your funny retirement gift beer can sleeves and having a retirement celebration! Six Can Coolers in a pack, enough for a six pack of beer! You've worked for decades to deserve this happy retirement, now drink up and kick back! Everyone will love these premium beer gifts coolers! PRINTED IN THE USA & 100% MONEY BACK GUARANTEE | Just like the hero who is retiring once and for all, our humorous best retirement gifts for men beverage cooler sleeves are incredibly funny, good looking, and practical. These drinking gifts sleeves are a perfect fit for 12 oz cans or 12 - 16 oz bottles. The collapsible can coolies fold flat and are machine washable. The design is die-sublimated for permanent, non-fading crisp colors. RETIREMENT PARTY DECORATIONS | Get several 6-packs of these can coolers for happy retirement party supplies, they're not just good humorous retirement gifts for men! When you've retired or need retirement gifts for a boss, coworker, friend, dad, father, grandpa, grandfather, male, him, mom, mother, grandmother, uncle, aunt, veteran, soldier, manager, brother, sister, nurse, military, first responder, teacher, bus driver, look no further than these retirement gift can coolies. RETIREMENT PARTY BBQ APPROVED | Gold Coastal retirement gifts for men premium beer bottle sleeves 6-packs are perfect for use whenever you need a cold beverage. Whether you're hanging out with fellow retirees, cruising with a cold soda in your classic car, celebrating Veterans Day or just partying you can count on this collapsible can insulator 6 pack set to keep cans cold for longer while keeping your hands dry!